Book an Ionian Dolphin Project expedition. Please find here all necessary information for booking and paying an expedition with the Ionian Dolphin Project. 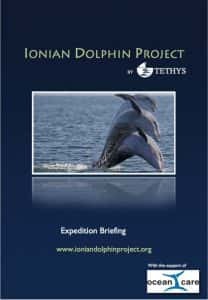 Are you interested in having a deeper glimpse into the Ionian Dolphin Project work before proceeding? Check out the project’s web page! download and carefully read the IDP Expedition Briefing information file: before booking you may want to know in advance which activities participants are involved in during the expedition. Tethys will notify you that the booking is confirmed and payed. Refunding: 20% of the participation fee is non refundable. In case of cancellation, a minimum of 30 days written notice must be sent to Tethys to be entitled to a reimbursement of 80% of the entire participation fee. Cancellation: 1) for those expeditions not reaching the minimum number of 3 participants, the Tethys Research Institute will reserve the right to cancel that expedition team (at least 10 days before its scheduled start); in this event the applicants affected will be fully reimbursed; 2) in case of a cancellation originating from any technical/logistical problem attributed to the Tethys Research Institute, the organisation will reimburse the applicants with the full amount of the participation fee (no additional reimbursements are foreseen) or, upon request, will try to place applicants in other expedition teams, depending on availability. Any application for a university student discount (below 26 years old) will require a copy of the valid student ID.